Imagine a video of Wally Wabash floating in space with the curvature of the Earth visible just over his shoulder. So did Kalp Juthani ’15, so he assembled a team, constructed a craft, and sent it to the upper atmosphere – upwards of 87,000 feet. Juthani and fellow members of Little Giant Productions launched a helium-filled weather balloon loaded with a Wally bobblehead doll and a video camera on March 21 from Hollett Little Giant Stadium. The six-pound craft contained a parachute for its descent, fruit flies, a data logger to record altitude, temperature, and pressure, and tracking units including a GPS locator and an amateur radio to aid in recovery. It’s one thing to send up a camera. It’s another all together to send up Wally. That makes this attempt unique. And a mystery it remains. While the launch itself was very successful, the craft separated during descent. One half landed in Connersville and was recovered. The other half, securing the camera, landed in a pond in Greenfield. The camera detached and has yet to surface. It’s probable that Wally may have led to that separation. While still working to recover the submerged camera, the missing footage leaves the experiment without a conclusion. The scientist in him understands the setback; the filmmaker wants to complete the story. “Not only would the video allow us to show and tell the story of what we were able to accomplish, but it will also allow us to overlay our data to provide us with a better idea of what actually happened once the balloon popped,” he explained. The idea behind the launch had marinated within Juthani since high school. It took a while for him to pull together the elements that would allow him to merge two of his passions: science and film. The amount of work to this point was nearly daunting. Juthani smartly enlisted the help of fellow students and professors across campus. From chemistry and physics to the student senate and the media center, many, have contributed to this point. Wally’s bracket was designed and built with the help of chemistry professor Lon Porter and the department’s 3D printer. 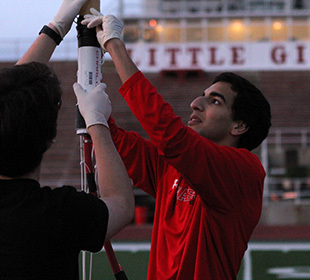 An unsuccessful launch attempt in the fall brought on a complete evaluation of the effort. Juthani and crew enlisted the help of Dr. Howard Brooks of the Balloon Assisted Stratospheric Experiments program at DePauw University. The contributions of many, the testing, planning, even the camaraderie have him confident in the results. Porter sees another positive from this. He’s proud of Juthani for engaging others to learn in a hands-on way outside of your comfort zone. Juthani sees that initial failure as a gift. He’ll continue to search for ways to recover the camera and cap the project. “The visual is the missing piece,” Juthani concluded.